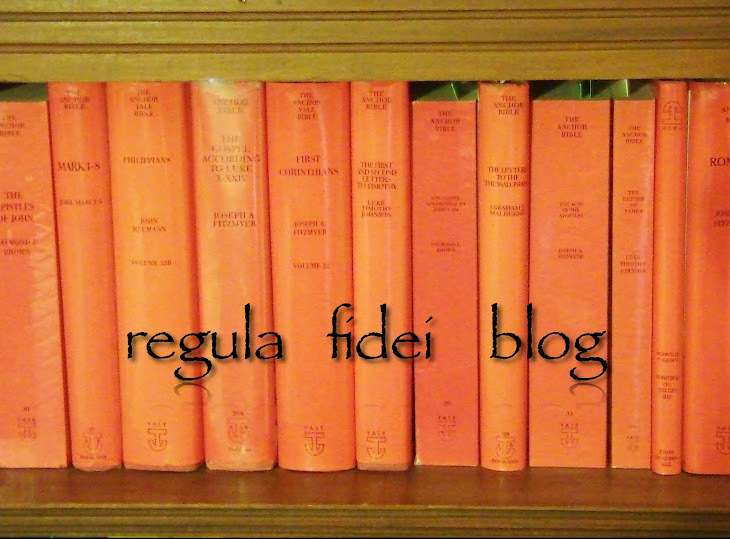 r e g u l a f i d e i: Textual Criticism: A Catholic Introduction. Textual Criticism: A Catholic Introduction. This will be a brief introduction to the discipline known as Textual Criticism in general and textual criticism of the New Testament in particular from a Catholic perspective. The ultimate end of biblical textual criticism is to get as close as possible to the original text, using various tools such as different methodologies and the comparison of ancient manuscripts. First let us consider the noticeable difference between Catholic (at least conservative Catholic) and Protestant textual critics. In the mind of the Protestant critic, to begin with, the early church (and consequently her writings) are not of a monolithic nature and thus flux, contradictory, and myriads upon myriads of textual families, text-types and the like are to be expected. In contrast, for the Catholic, uniformity and a general single text type that has a wide geographical distribution and consensus especially as displayed in Patristic Fathers is to be preferred. In my opinion textual criticism is not the same as general theology, it calls for much more breathing room. In other words even if one holds an eclectic methodology in textual criticism this does not presuppose an eclectic theological methodology. The fact that single small textual variants exist in the manuscript tradition does not at all call into question the monolithic nature of the Regula Fidei. In Search of the Autographs: Manuscripts. The term autograph in textual criticism refers to the original writing itself. Not a single autograph of the New (or Old) Testaments exists, however, it is the task of the textual critic to study and examine the existing ancient manuscripts and try and re-build the closest model to the original. The intricacies that are involved are immense, here I can only refer the reader to the classical introductory texts. The earliest of the Greek manuscripts are found to be written on papyrus leaves and are given titles such as P1, meaning "Manuscript Papyri 1." All of these papyri manuscripts have been variously dated some earlier than others and thus more important (among the earliest are P52 which is dated from the beginning of the second century). In time (starting around the third century) the majority of manuscripts were starting to be written on vellum rather than papyri and these are known as Uncial type manuscripts (these are designated by alphabet lettering, such as "A" for Codex "Alexandrinus," some by Greek alphabetical lettering and a few in numbers such as "0220.") Yet another manuscript type is known as the "minuscule" because of it's cursive letter form, this became the popular mass issue under the Byzantines (these are usually designated by numbers such as "2344".) These are the major text types, there are several minor types that I won't bother to go into at this point (see the introductions below). So we have given a very brief outline of the manuscript types of the New Testament. Now the question is how does one read these text types and make sense of the evidence in favor of one reading over the other? Several major textual critical methodologies have been championed by one critical scholar or the other as the "best" way to understand the manuscripts and see past through the plethora of scribal errors that have crept into the manuscripts. Among all the different approaches I concur with the overwhelming majority of text critical scholarship that the best method to read the evidence is a form of "Reasoned Eclecticism." The maxim of this view is, "we read the manuscript evidence with two eyes, one on the external manuscript evidence and the other on the internal evidence or the scribal tendancies." Within this camp are two divisions, those who give greater weight to the external evidence and vice versa. "Equally I reject any way of judging and interpreting Holy Scripture which takes no account of the Church's Tradition, or the analogy of faith and the norms laid down by the apostolic See: which adheres to the theories of the rationalists, and presumptuously and rashly accepts textual criticism as the only supreme rule." (143/9). Now let us inaugurate a new series on difficult textual critical passages and see if we can shed some light on the problems. The RSVCE renders the text in question as, "No one has ever seen God; the only-begotten Son, who is in the bosom of the Father, he has made him known." However, there exists strong arguments against the originality of "only-begotten Son" in favor of the reading, "No one has ever seen God; the only-God, who is at the Fathers"
Internal Evidence: As to how the "Son" reading came into existence it can be explained that early scribes assimilated to other familiar Johannine texts of this type, (i.e., 3:16, 1 John 4:9). Therefore, it is much more probable that an early scribe "fixed" the perceived scribal error that introduced "God" to the much more common Johannine "begotten-Son" than to suppose that an early scribe would go against Johannine usage and introduce the "God" reading. So then, this θεὸς reading has gained the wide support of the critical consensus from scholarship from all the theological traditions. Moreover, Craig Keener in his recent mammoth commentary on John (2003, Vol 1. 424) argues that the "Son" reading came naturally from the parts of Egypt embroiled in the Arian controversy since the title with "only" brought to mind "only begotten Son" which would have fit nicely for the heretical Arians who denied the full divinity of Jesus. The best internal argument for the originality of the "Son" reading is that θεὸς derived from a visual error of the original Greek abbreviation, OC for YC (on this point see especially F. H. A. Schrivener (A Plain Introduction to Criticism of the New Testament. 1894, 358), followed by A. Wikgren's notation in Metzger's (Textual Commentary. 2005, 198) ). On the other hand this particular contention was answered as long ago as F. J. A. Hort (Two Dissertations. 1876, 10) and B.F Westcott (St. John. 1880, 33) who both convincingly argue that if OC was erroneously changed to YC how does one account for the omission of the article in μονογενὴς θεὸς ? If however the opposite took place and "Son" replaced the original "God" the article would have been naturally added in full agreement with Johannine usuage. External Evidence: Some of the earliest manuscripts that contain this section of John support the θεὸς reading; P66, P75, as well as the best of the Uncials; Sinait, B, C, L and Patristic support; St. Hilary of Poitiers, St. Basil, The Apostolic Constitutions, Didymus The Blind, St. Gregory of Nyssa, St. Epiphanius, St. Jerome. The "Son" reading has the inferior attestation with; A, and a host of the later minuscules and the Majority Text type (while wide spread geographically they are dated much later in comparison).
. Eberhard Nestle, (Introduction to the Textual Criticism of the Greek New Testament. 1901), Kenneth Clark, (A Descriptive Catalogue of Greek New Testament Manuscripts in America. 1933), William H. P. Hatch, (The Principal Uncial Manuscripts of the New Testament. 1939), Frederic G Kenyon, (Our Bible and the Ancient Manuscripts. 1958), Ernest Colwell, (Studies in Methodology in Textual Criticism of the New Testament. 1969), Eldon J Epp, (New Testament Textual Criticism: Its Significance for Exegesis. 1981), Kurt and Barbara Aland, (The Text of the New Testament. 1988), Philip W Comfort, (The Quest for the Original Text of the New Testament. 1992), Bruce Metzger, (The Text of the New Testament. 1992), Jacob H Petzer, (New Testament Textual Criticism. Exegesis, and Early Church History. 1994), David A. Black, (Rethinking New Testament Textual Criticism. 2002), among others.
. The earliest Greek manuscripts also display certain features in common such as scriptora continua (or no spacing between words in the text). Certain lectoral markings, slash marks to prepare for oral readings, Nomina Sacra and so on. A distinct field of expertise has arisen focused on the dating and chronology of manuscripts called Paleography.
. A few examples of common scribal errors are; "conflated readings" or when a scribe attempts to resolve a textual problem by simply including more than one of the variants, "interpolation" or when a scribe attempts to solve a difficult textual problem by "smoothing out" the difficult Greek.
. For a strong defense of this position see Michael W Holmes, (Rethinking New Testament Textual Criticism. 77-100) or any of the works of Metzger.
. This textual decision is also followed by KJV, ASV, Douay-Rheims, ERV, NEB, NJB, REB, and others.
. Which is seen in the NIV, NAB, NASB, ESV, ISV, and others.
. In line with this internal reasoning to support the θεὸς reading see; F. J. A. Hort (Dissertations. 1876, 14-15), B.F Westcott (St. John. 1881, 32), T. Zahn (Johannes. 1908, 94), J. H. Bernard (St. John: ICC. 1929, 31), M. J. Lagrange (Jean. 1947, 26-28), K. Rahner (Theological Investigations. 1961, 136-37), Raymond E Brown (John 1. 1966, 17), L. Morris (John. 1971, 113), B. Lindars (John. 1972, 98-99), C.K Barrett (St. John. 1978, 169), R. N Longenecker (The Christology of Early Jewish Christianity. 1981, 137), F.F. Bruce (John. 1983, 44-45), J. R. Michaels (John: GNC. 1984, 9), G.R Beasley-Murray (John: WBC. 1987. 2), D. A Carson (John: PNTC. 1991, 139), B. Metzger (Textual Commentary on the Greek New Testament. 2005, 169-70), Philip Comfort (Encountering the Manuscripts. 2005, 328).
. Despite the enormous consensus in critical scholarship for the θεὸς reading a few still hold for the originality of "Son" cf. F. Godet (St. John. 1877. 378), E. C. Hoskyns (The Fourth Gospel. 1947, 152), M. E. Boismard (St. John's Prologue. 1957, 66), R. Bultmann (John. 1971, 81), E. Haenchen (John: Hermeneia. 1984, 1. 121). Hi, there! Found your blog today and noticed you were citing Eberhard Nestle. Thought you might be interested in a brand new pre-publication offer from Logos Bible Software on the works of Eberhard Nestle! Thanks and let me know if I can help in any way!